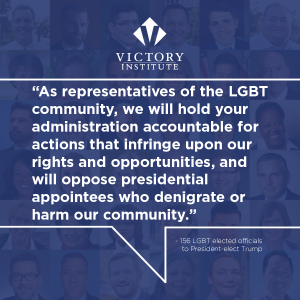 Mayor Lydia Lavelle and I have joined 154 other lesbian, gay, bisexual, and transgender elected officials from across the country in sending a letter to the President-elect. We have concerns, naturally. Read the open letter here: http://bit.ly/2jM3VTy. The letter expresses our concerns about the President-elect’s nominees to his administration. Nearly all of them have espoused anti-LGBT views aimed at denying us acceptance and inclusion in the law, in our families, and in our communities. Many of them proudly tout legislative records opposing basic legal rights for LGBT Americans, and some have openly denigrated our lives and our personal relationships. The letter urges the President-elect to govern with the values of inclusion, fairness, and justice. We are committed to ensuring that all of our constituents have a voice during the next administration. This entry was posted in news on January 13, 2017 by Damon. Late-breaking news from the North Carolina Department of Transportation at this morning’s meeting of the Durham-Chapel Hill-Carrboro Metropolitan Planning Organization: With the completion of the latest statewide prioritization of transportation projects, NCDOT programmed funds for three important pedestrian and bicycle projects in Carrboro. 1. A sidewalk on the north side of Jones Ferry Road from Davie Road to Main Street. This project will complete a large gap in a heavily used portion of Carrboro’s sidewalk network in the most densely populated part of town. 2. A sidewalk on Barnes Street between Jones Ferry Road and King Street. This project will connect residential areas in and around the Lincoln Park and Whispering Hills neighborhoods to the major pedestrian corridor on Jones Ferry Road. 3. And now for the big one: Sidewalks and bike lanes on Estes Drive between N Greensboro Street and the town limit (and continuing to Martin Luther King Jr Blvd in Chapel Hill). This project promises to improve one of Carrboro’s biggest problem areas for pedestrians and cyclists. It will take time for the project to move through public comment, design, right-of-way acquisition, and construction, but we’re finally on the list. While those of us on the policy-making board of the MPO have the fun of making decisions about which projects to submit for funding, the real work is done by professional staff on the technical committee. 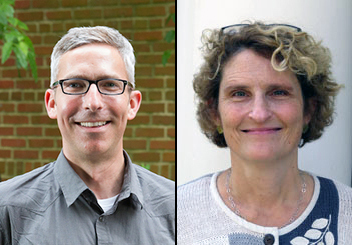 This committee includes staff from the Carrboro Planning Department, who worked hard this year (as they do every year) to identify projects that meet our community’s needs and have a strong likelihood of receiving funding. I’d say they’ve had a good year. This entry was posted in planning, transportation, Uncategorized on December 14, 2016 by Damon. Today I submitted the comments below to the North Carolina Department of Transportation regarding the H 232 Bicycle Safety Laws Study Report. This report makes recommendations to state legislators for changes to state laws on bicycle safety. Most of the recommendations are sensible and will promote the safety of cyclists, which is the stated purpose of House Bill 232, the legislation that called for the report. A few of the recommendations, however, would lead to the opposite of cyclist safety. Read more about the legislation and the study report at ncdot.gov/bikeped/lawspolicies/. More resources are available from BikeWalk NC. This entry was posted in news, transportation on December 29, 2015 by Damon. Good morning! I’m happy to announce that I will file next week as a candidate for re-election to the Carrboro Board of Aldermen. Update: Listen here to my afternoon interview with WCHL/Chapelboro’s Aaron Keck. Two years ago, after several years of involvement in town and county government, I came into office ready to bring my experience and energy to the Board of Aldermen. Today, my enthusiasm for representing and advocating for Carrboro residents has only grown stronger. My work has stressed responsiveness to and collaboration with neighbors and community organizations on a wide variety of issues, from improved bus service and pedestrian and bicycle infrastructure to civil liberties and social justice. Among my first accomplishments was to revive the board’s effort to bring the town’s lowest-paid employees up to a new living wage. I also led a response to legislation in the North Carolina General Assembly that threatened local environmental rules, resulting in new protections for Carrboro’s stream buffers and tree canopy. I am especially proud of my advocacy for expanded nighttime and weekend bus service as a member of the Chapel Hill Transit Partners Committee. Renewed nationwide focus on policing, civil liberties, and racial equity has presented us with an imperative to engage with our neighbors in understanding and improving local law enforcement. I have partnered with town staff, residents, and advocacy groups to organize community forums on policing and to craft policies that serve everyone equitably. 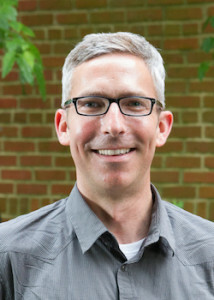 policy making that encourages broad participation, fosters partnerships with and among community groups, and builds on Carrboro’s reputation as a progressive community that values diversity and social justice. I look forward to continuing to build relationships with my neighbors, to deepen my understanding of our community’s needs and challenges, and to promote solutions that reflect our values. Keep up with my campaign and local happenings by following me on Twitter and liking my Facebook page. This entry was posted in news on June 29, 2015 by Damon. This weekend, the return of hot weather marked the return of office hours. My special guest was Mayor Lydia Lavelle. We took advantage of the town’s first try at Summer Streets, during which Public Works closed East Weaver Street to traffic for much of the day. As I said on Twitter, there was something downright civilized about closing the street (if just for a little while) and reclaiming the space for people. With this temporary pedestrian plaza in place, Lydia and I found a shady, breezy spot in the middle of Weaver Street, and one of us (possibly me) ate blueberry pancakes. 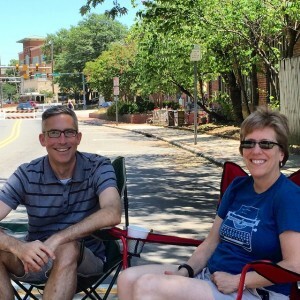 Our visitors came to share their thoughts about the impact of new development on Carrboro’s character, questions about policing, and ideas about repairs and upgrades to town facilities. Mark your calendar for the town’s two remaining Summer Streets events: July 19 and August 23. We would love to receive your feedback. And I might just use those opportunities for more office hours. This entry was posted in Uncategorized on June 21, 2015 by Damon. Today I took a tour of the Durham-Orange light rail transit (LRT) corridor, courtesy of Triangle Transit staff. We started at Triangle Transit headquarters in RTP, picked up a helpful if bulky set of maps and other materials, and made our way to the proposed western terminus of the LRT project in Chapel Hill. I used the event as an opportunity to live-tweet the tour for local politics blog OrangePolitics (where this entry is cross-posted). Below is an archive of my tweets from today’s tour. Do you have questions about the Durham-Orange LRT project? The next couple of public meetings will take place on June 4 (4:00-7:00 pm, Durham Station) and June 6 (2:00-5:00 pm, John Avery Boys & Girls Club). Attend a forum and/or find more information at ourtransitfuture.org. This entry was posted in planning, transportation on April 1, 2015 by Damon. Today I participated in a panel discussion at the NCCU School of Law, “Women’s Health Policy in North Carolina and National Trends.” I shared information about the Carolina Abortion Fund‘s work and discussed barriers that North Carolina women face in accessing abortion services. This is a good opportunity to hit you up for money. I’ve recruited a crack team of Orange County elected officials and one political spouse—The Wrecking Electeds—to participate in the Fourth Annual Abortion Access Bowl-a-Thon. Please help me, Chapel Hill Town Council member Donna Bell, Orange County commissioner Mia Day Burroughs, Carrboro alderwoman Bethany Chaney, Hillsborough commissioner Jennifer Weaver, and superstar Jason James to reach our modest fundraising goal. Just a few dollars will go a long way for this group of first-time bowlers. This entry was posted in Uncategorized on March 17, 2015 by Damon. In a previous post, I discussed the important policy and training work that the Carrboro Police Department has done over the past year. Some of this work—such as developing a policy for the use of police cameras—predates the latest national wave of attention on law enforcement issues. Other work by the department is underway in response to questions and concerns that community members shared during the town’s October community forum on policing. Today I’m writing to provide an update on early progress on items in my previous summary and to share some notes from three meetings I attended recently. In early December, Police Chief Walter Horton and both police captains attended an Organizing Against Racism racial equity workshop. The department is exploring opportunities for future training opportunities for administrative staff. The department is partnering with other law enforcement agencies in Orange and Durham Counties to enroll officers in the Fair and Impartial Policing “train the trainer” program, tentatively scheduled for the summer of 2015. The department is working with Orange County public defender James Williams and civil rights attorney Ian Mance of the Southern Coalition for Social Justice to develop reports for tracking data in the department’s record-keeping system. Also, at James Williams’s suggestion, the department has been in contact with the UCLA Center for Policing Equity to make arrangements for review of the department’s data. The department is planning another community forum on policing for June 2015. The department is in contact with the Durham Police Department to obtain information about its recently adopted policy to require written consent for searches. Finally, I expect that the Board of Aldermen will consider including body-worn police cameras in the town’s budget for the next fiscal year. I was pleased to be able to attend a forum on January 3 at the Rogers Road Community Center hosted by the Chapel Hill-Carrboro Branch of the North Carolina NAACP. The forum, moderated by Carrboro activist Diane Robertson, featured a question-and-answer session with Chief Horton, Chief Chris Blue of Chapel Hill, and Sheriff Charles Blackwood. A good summary of the event is available on OrangePolitics. A complete audio recording is available at Chapelboro.com. The forum reaffirmed for me the central importance of acknowledging, understanding, and addressing racial disparities in law enforcement. Attendees of the forum also expressed interest in greater transparency related to law enforcement agency policies (for example, policies on the use of force) and procedures for filing and resolving complaints. Also on January 3, Alderwoman Michelle Johnson and I had the opportunity to meet with two Carrboro residents, Geoff Gilson and Amanda Ashley, who have been paying close attention to policing issues and advocating for changes in policing policies and methods. 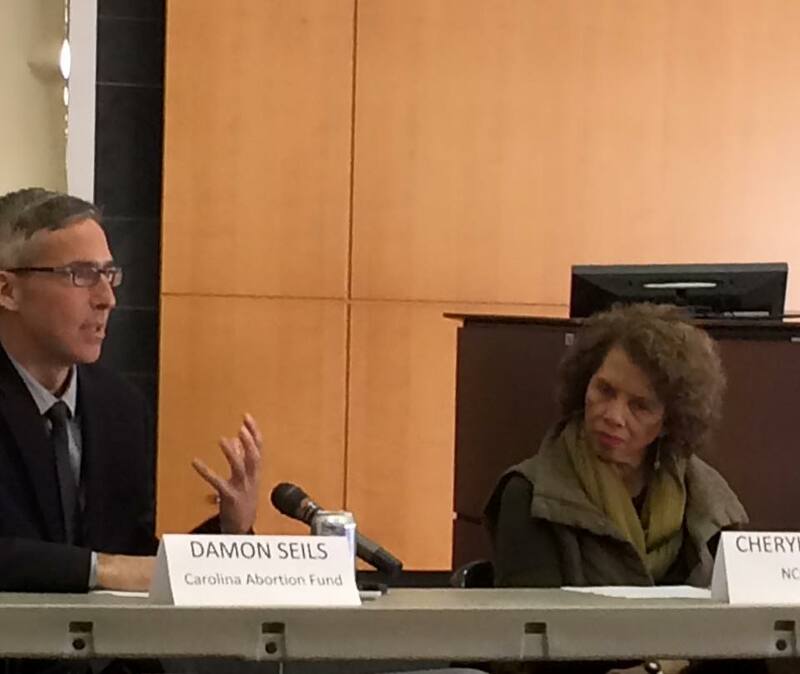 As in the NAACP forum, an important feature of our conversation was transparency. We talked about the possibility of making existing policies more readily available. Questions related to whether policies could be published on the town website; rules of engagement and policies on the use of force; and the process for investigating uses of force (specifically, deadly force). We also discussed bringing greater structure to ongoing efforts to engage the community in shaping law enforcement policy, and being clearer about next steps so that community members know about opportunities for participation. For example, we talked about formalizing the structure of upcoming community forums, particularly in relation to making the forums goal-oriented and requiring a follow-up report to the Board of Aldermen after each forum. Shortly after the October community forum, the police chief raised the idea of focusing each subsequent forum on a particular policing topic. I like the idea of devoting forums to particular topics, identifying important questions and concerns on the basis of community participation in those forums, setting clear goals, and measuring and reporting outcomes. Stay tuned for the next forum, tentatively planned for June 2015. Speaker after remarkable speaker at the conference—scholars, lawyers, civil rights activists, and community organizers—offered insights into the racialized history of law enforcement in the United States, troubling overviews of traffic stop data in North Carolina municipalities (including dramatic numbers from Carrboro), and strategies for reducing racial disparities in policing. Professor Frank Baumgartner of UNC Chapel Hill has analyzed data on 17 million traffic stops in North Carolina. See http://www.unc.edu/~fbaum/traffic.htm. Recommended reading from keynote speaker Sherrilyn Ifill of the NAACP Legal Defense Fund: American Apartheid (Massey and Denton); Black Wealth, White Wealth (Oliver and Shapiro); Sundown Towns (Jim Loewen); The Warmth of Other Suns (Elizabeth Wilkerson); and “The Case for Reparations” (Coates). Implicit bias training for law enforcement officers and other people in positions of public trust. This training should be seen as a part of the professionalism of policing. Don’t simply stop implementing bad policies and making bad investments. Undertake policy changes and make investments that reverse the negative effects of previous and existing policies and investments. mandatory written consent for consensual searches of vehicles and homes. These approaches are good starting points for discussion, and most are already under consideration in Carrboro. Please continue to be in touch with the Board of Aldermen at boa@townofcarrboro.org if you have thoughts about policing and other issues. We want and need to hear from you. This entry was posted in news, policing on January 28, 2015 by Damon. How about a warm beverage and some public policy on a chilly Saturday afternoon? Join me and your newest county commissioner, Mia Burroughs, for office hours on Saturday, January 10, from 3:00 to 5:00 pm. We’ll settle in at a table at Looking Glass Cafe in Carrboro and start talking shop. Recent topics of conversation between the Carrboro and Orange County boards include planning for a southern branch library, public transit, sewer service in the Historic Rogers Road Neighborhood, use of economic development funds from the quarter-cent sales tax, affordable housing, solid waste, a potential 2016 bond referendum, and more. If you’re interested in talking with us about any of these topics, or about other Carrboro-Orange County issues, please join us. We’re looking forward to seeing you. This entry was posted in events on January 7, 2015 by Damon. Renewed focus on law enforcement after yet more instances of police violence around the country—most notably in Ferguson, Missouri—has brought many of us together to consider a local response. A variety of steps by the Town of Carrboro in the past year present a good opportunity to catalog some of the work going on with our Police Department. Most important is a set of first steps being taken by town staff, informed by conversation with community members in a recent community forum, which I summarize below. I then describe a few other items of interest related to Carrboro (and Orange County) policing. My fellow board members and I welcome your thoughts about these issues. You can reach us by e-mail at boa@townofcarrboro.org. On October 6, the town hosted a forum to hear community members’ concerns, questions, and ideas about policing in Carrboro. Several dozen community members attended the forum. Police Chief Walter Horton, the town manager, several other members of town staff, and members of the Board of Aldermen were also present. additional community engagement activities, including at least 2 community forums per year, the next tentatively scheduled for June 2015.
information about other resources or support the Police Department may need from the Board. Stay tuned for coming opportunities to shape policing policy in our town, including additional community forums, departmental outreach efforts to neighborhoods and community groups, and more. There’s more going on in our local law enforcement world, some of which I summarize below. I’ll begin with an exciting development that came up this week. During Monday’s meeting of the Orange County Board of Commissioners, Commissioner Mark Dorosin petitioned the board to work with newly elected Sheriff Charles Blackwood on a gun buyback program for the county. Sheriff Blackwood confirmed that he is interested in initiating such a program. When I spoke with the sheriff after the meeting, he raised the idea of a joint program with the Town of Carrboro and other municipalities. Stay tuned. In July, the Police Department launched the Police to Citizen (P2C) incident reporting system, which enables public access to police incident reports, arrest reports, and traffic crash reports. P2C allows users to search, map, download, and print police reports. In June 2013, the Board of Aldermen approved the purchase of in-car cameras for police vehicles. The cameras went into use this fall after several months of work with the Police Department, legal staff of the ACLU of North Carolina, and others to develop a policy that addresses concerns about the cameras’ proper use. The mobile recording system policy addresses when the cameras are activated and deactivated, access to and retention of recordings, disciplinary actions for violations of the policy, and more. I hope that this comprehensive policy can become a model for other communities in North Carolina. This entry was posted in news, policing on December 3, 2014 by Damon.